On 31 May 2017 at 18:00 the Unrepresented Nations and Peoples Organization (UNPO) - with the generous support of the Nando and Elsa Peretti Foundation - will organise a screening of the documentary “Martírio” at the Atelier Marcel Hastir. The event aims to raise awareness for the cause of the indigenous Guarani-Kaiowá communities in Mato Grosso do Sul (Brazil), who have struggled for the demarcation of their ancestral lands and for the respect of their human and minority rights. According Vincent Carrelli, who directed the film along with Ernesto de Carvalho and Tatiana Almeida, the present situation of the Guarani-Kaiowá in Brazil is the most critical in over a hundred years of struggles with the government and agricultural interests. 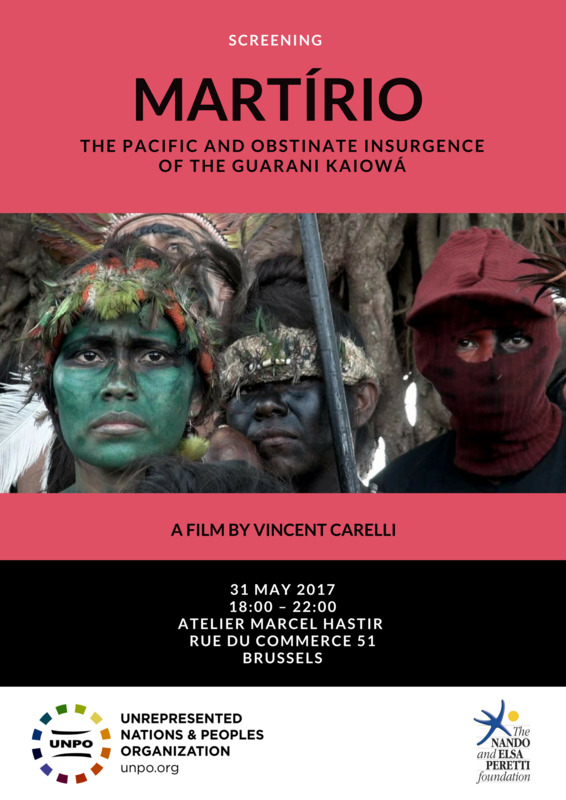 The screening follows a fact-finding mission organized by UNPO in December 2016 and the conference at the European Parliament entitled “The Guarani-Kaiowá and the Assault on Indigenous Rights in Brazil” which takes place on 30 May. Martírio is the result of years of work of Vincent Carelli as an anthropologist, indigenous expert and filmmaker. Released in April 2017, it gathers archival and historical footage, new footage of Guarani-Kaiowá representatives, and scenes from hearings in the Brazilian Congress, and it has been awarded prizes in festivals such as the Mar del Plata Film Festival, the São Paulo International Film Festival, and the Brazilian Film Festival of Brasília. The film documents the fight of these communities against the gross violations of their human rights, at the same time that it offers a brilliant image of their culture and history. It is the second part of a trilogy centred around decades of indigenous struggle in Brazil, which started which the documenraty “Corumbiara” (2015) and will conclude with “Adeus, capitão”, presently in production phase. The Guarani-Kaiowá, who inhabit areas of the Amazon rainforest, are an indigenous people living in Mato Grosso do Sul, the Brazilian state with highest incidence of anti-indigenous violence, with intense conflicts between the communities and influential land-owners, as the indigenous ancestral lands are taken to make way for industrial farming of soy, corn or sugarcane. Resistance is often met with brutal force, and the Guarani-Kaiowá find themselves in a precarious situation, with a high suicide rate and increasing reports of murders, torture and forced disappearances of indigenous leaders. Furthermore, environmental degradation has been causing contamination in the region inhabited by this population, spreading diseases and hindering the right of this group to adequate food.